The EnStyro Separator operates in line with the particle flow from the shredder to produce two distinct size fractions. The separator like the shredder can be purchased with a variety of screen sizes to fit the needs of your unique end usage. The separator is mostly used to produce packing peanuts from bulky waste foam. In this case the EnStyro foam shredder uses a large screen insert with 1.5 to 2 inch square openings. The shredded foam is then a variety of sizes from very small up to 2 inches. This shredded foam flows directly through the separator which removes particles smaller than the chosen screen size. A good choice for separator screen size is ½ to 3/4 inch. The smaller particles can be used for concrete aggregate, bean bag stuffing, or loose fill insulation. The majority of the material is ready to use packing peanuts. 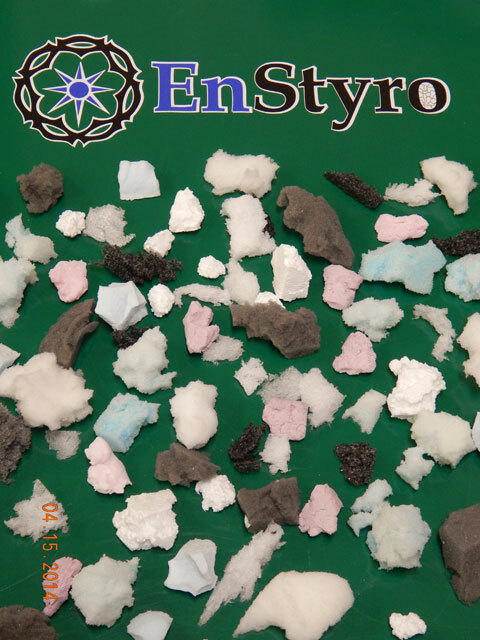 With the EnStyro packing peanut method a variety of different foams can be recycled. Memory foam, polyurethane foam, furniture foam, and polyethylene foam can all be recycled into packaging material. The EnStyro Shredder and Separator can provide specific foam particles for a variety of old and new products. With many screen sizes available, we can provide a product to fit your needs. Removing fines before remolding of EPS products. Collecting very fine material for concrete sculpting. Easy to paint or coat particles. Specified size ranges of EPS particles. Producing packing peanuts from a wide variety of recycled foams.